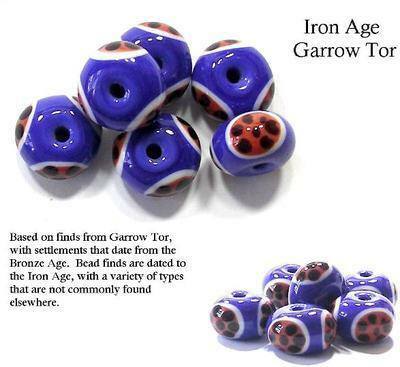 Based on finds from Garrow Tor in Cornwall, a site known for settlements dating from the Bronze age on through the Iron age and later, these beads are of a unique style for the British Isles and are Iron age in date. The image shows a selection of beads as examples of the bead type, the price is £4.00 per bead. The beads measure approximately 10 x 18mm but will vary as each bead is individually handmade.